Learn about Vietnamese history as well as culture at some of the most famous spots in HN. Sample delicious Vietnamese cuisine just like the locals do - on the street. Know more about the diversity of Vietnam’s religions. Enjoy an amazing full day tour of Huong Pagoda in Hanoi. Know more about the spiritual life of Vietnamese locals. Tour Hanoi’s Old Quarter street markets. Discover the culture of Vietnam through Hanoi's cuisine. Sample and enjoy Hanoi's local specialties. Enjoy an amazing full day tour of Perfume Pagoda in Hanoi. Learn more about the the spiritual life and the diversity of Vietnam’s religions. Cycle across the Long Bien Bridge. Tour the tranquil countryside of Hanoi. Meet friendly people in a farming village. Boat trip on Yen Stream. Climbing up to Huong Tich grotto, lunch en route. Largest national park in Vietnam. Primates' rescue & breeding center. Explore the 'cave of prehistoric man'. Explore the local streets on a walking tour of the city. Explore Trang An and Bai Dinh Pagoda in Ninh Binh. Visit Ba Dinh Square, Ho Chi Minh's house, One-Pillar Pagoda and Kiem Lake in Hanoi. Enjoy the many caves and islands in Halong Bay. Despite decades of war and occupation, Vietnam as a whole remains one of the most popular travel destinations in the world. As Hanoi works tirelessly to bring itself into the modern world, it is a fully fledged, rapidly developing city. Hanoi’s beauty lies in the layers of historical context that provide the perfect backdrop to the modern skyscrapers and malls of the future. Expect an eclectic fusion of French, Chinese and traditional Vietnamese culture that makes Hanoi truly one-of-a-kind. 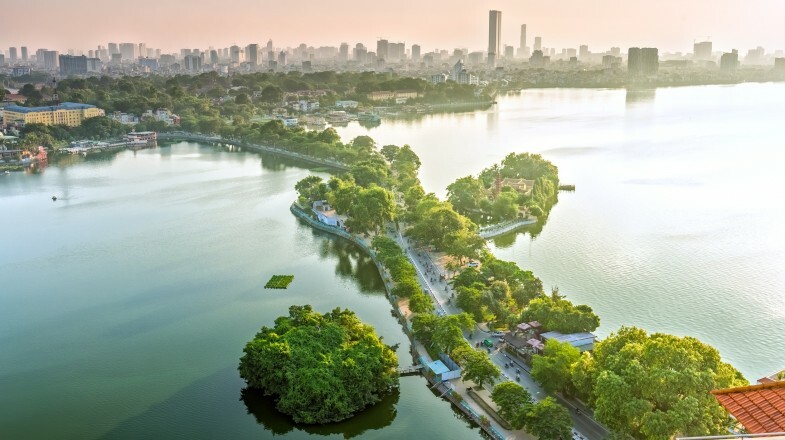 Start your day like the locals and take an early morning walk around Lake Hoan Kiem. You’ll get to greet other strollers pass you and even watch the peaceful practice of Tai Chi before the work day begins. For the best view of Hanoi, head to the Lotte Tower observation deck on the building’s 65th floor. You’ll find an uninterrupted view of the city that really brings into focus the level of growth Hanoi has recently experienced. A must-visit is the Vietnamese National Museum of Fine Arts which offers mesmerising exhibits of Buddhist art, silk work, lacquered paintings and a jaw-dropping depiction of the goddess Guan Yin who has a thousand eyes and a thousand arms. Explore the Old Quarter and visit one of the oldest temples in Hanoi. Bach Ma temple is in the heart of the Old Quarter, and while it has undergone reconstruction, it’s original structure was built in the 11th century. While in the Old Quarter, visit the Dong Xuan market where you’ll find some affordable wares. Bargaining is a way of life in Vietnam. Eat for cheap at the Old Quarter’s delicious street stalls. Buses are the main mode of public transport. These are affordable and efficient. Dress conservatively, especially at religious sites. U.S. dollars are widely accepted but you may not get the best exchange rate. Before you leave, check with your doctor that you have all relevant vaccinations for Vietnam which include Hepatitis B, tetanus-diphtheria and typhoid.